It was a no brainer we needed to jump on board and we needed to do it now! 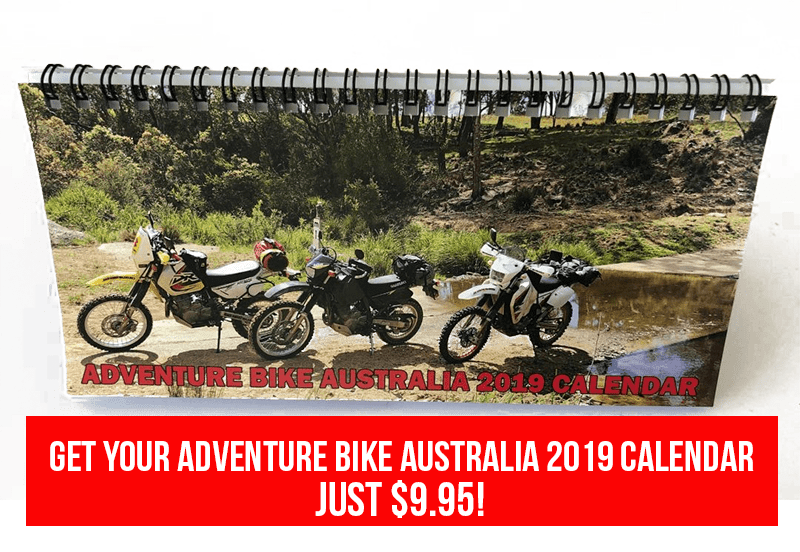 We’ve been with the Northern Rivers Adventure crew before and this one being organised by Dave and Karen Ramsay had “book me now” written all over it. 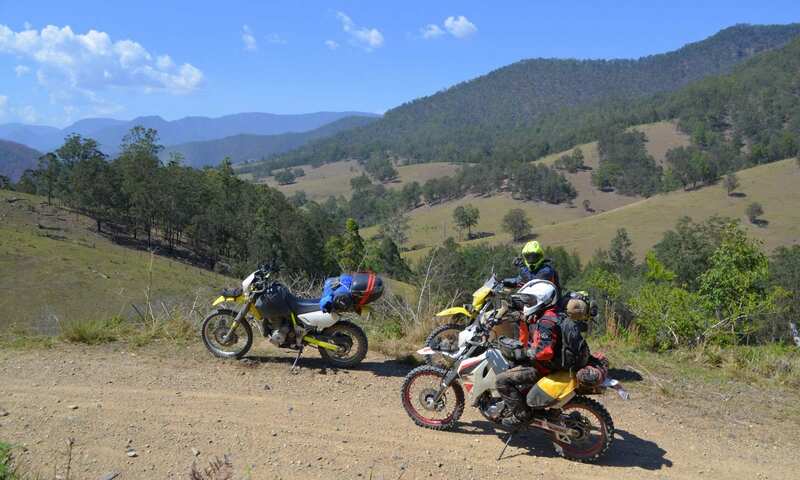 Dave’s run this particular ride before, sure I know a lot of the country but there’ll be stuff I don’t know which ended up being the case, there’s some great places to ride, Far Northern NSW is one of them! We got away early in fact as early as Friday LOL, one of my team is not an early riser plus the lure of a night out staying in a country coastal pub is all part of the adventure. Turns out Evans Head pub on a Friday night is the place to be so we just joined on in and boogied along with the DJ and the local surf set! A big turn out the next morning of 25 riders had Dave meeting and greeting and running through the mandatory rules and general run down of the event and I always love the bit “ride at your own pace” sorry guys! 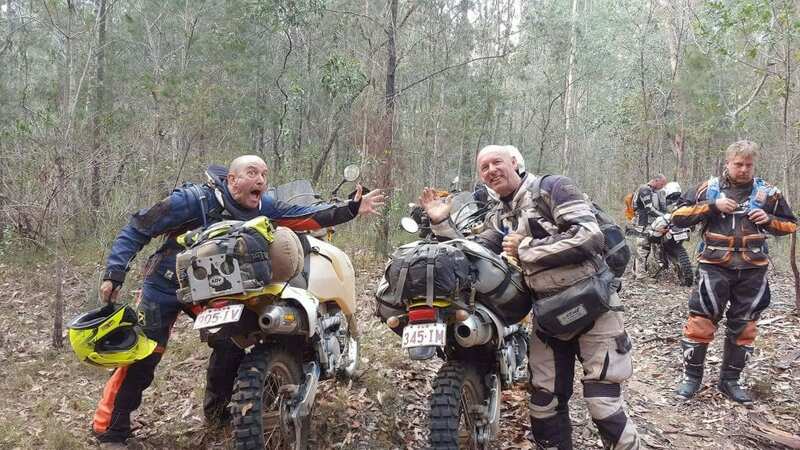 Before we rolled off we knew it would be dusty but I tell you not since I’d run my Gold Coast Suzuki monthly overnight adventure rides back in the peak of a dry season had I seen it this bad. In fact bad would be an understatement but credit here despite such bad dust Dave and Karen had this ride running like clockwork. We also struck it lucky with what appeared to be a quite pre holiday time of year both on the road and our camp ground, we had the whole place to ourselves! And the weather sure it was dusty but fine and clear, the night was even for this time of the year, cold. 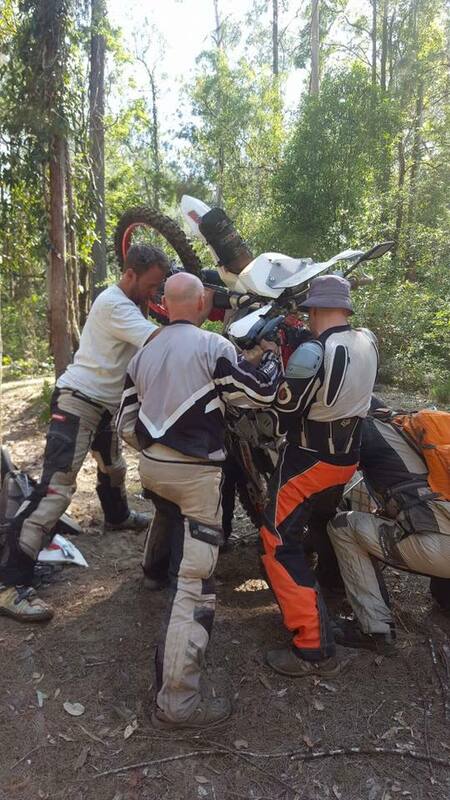 Only a couple small dramas enroute to our overnight camp, a big KTM fell fowl in a dry sandy/rocky creek crossing braking his rear brake pedal and the boys did well with a great bush repair to see his weekend out. And then one of my own Gold Coast crew was unlucky enough to have what appeared to be a razor sharp rock slice through the rear of a new D606. The tyre slashed had the inner rubber of the tyre sticking through rubbing on any attempt of a new tube. We bandaged things up as best as we could and made a sleeve to fit over the offending damaged area. 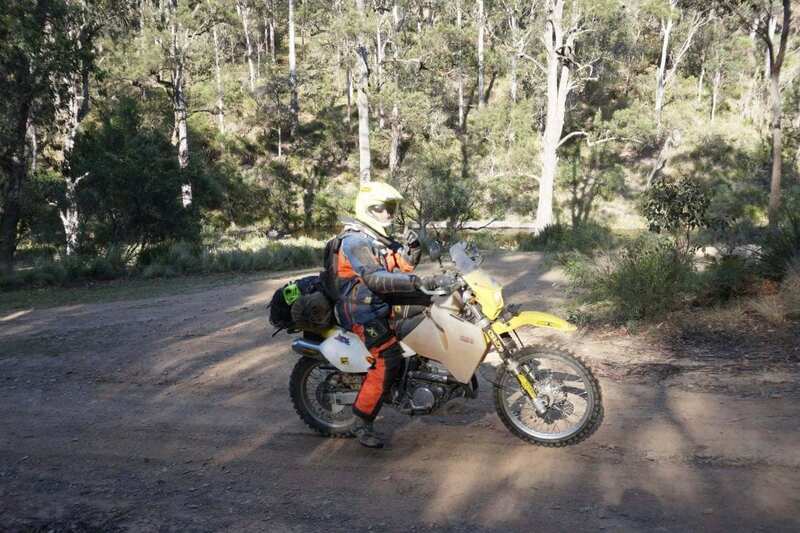 Not so noticeable on the bush tracks but this was no fun on the black top having to keep speeds down to under 90klph such was the tyre so out of balance. 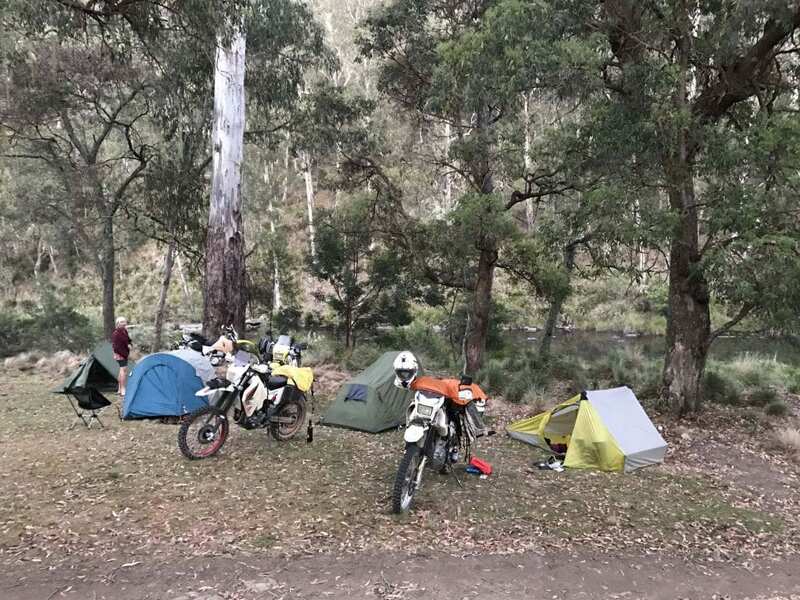 We caught up to the crew at Ebor and motored down to our overnight stay on the Styx River with Dave throwing a nice single track in the mix for those who wanted it, just heaven on our little bikes! With plenty of room everybody strung out camping along the river, the water just fresh enough for a dip and to wash the days dust away. Again I can’t say enough about the great organising, some of Dave’s mates from the Coff’s 4wd club had all the cold drinks organised, plus dinner and yes bacon and egg rolls for breakfast. This was just heaven, everybody tipped in a few dollars with enough also raised to pass onto the local rescue helicopter, brilliant! Another 8 riders meet us at the over nighter so tomorrows send of was going to be a beauty. Mates to the rescue we dewatered the DRZ and caught back up to the rest of the crew as we approached the morning tea rest stop. And I use the word morning tea as Karen had made and carried Tupperware containers with fresh cookies for everybody, unbelievable. 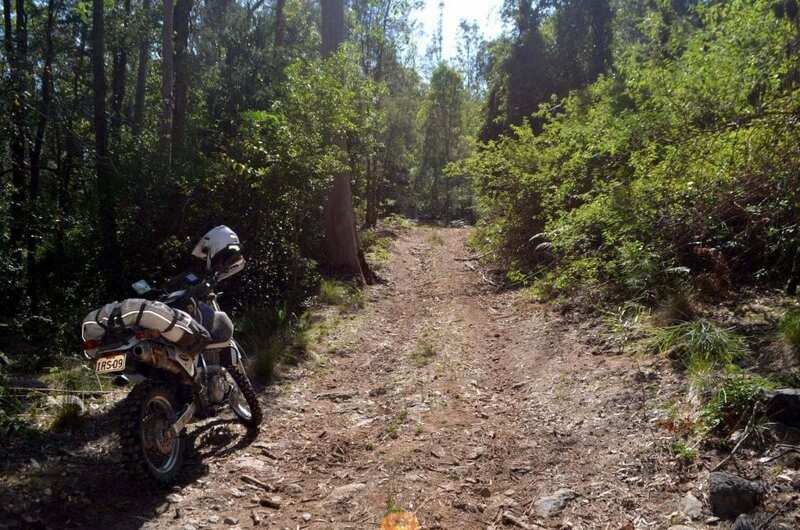 Being a bit of a single track junkie some of the following roads I hadn’t done before and I must say I loved em. With riders spread out dust was down to a minimum. You could see miles ahead across fields and the roads flowed like something out of a road runner scene. We arrived at Glen Innes well after lunch and decided to make this the end of the road as far as an organised ride. 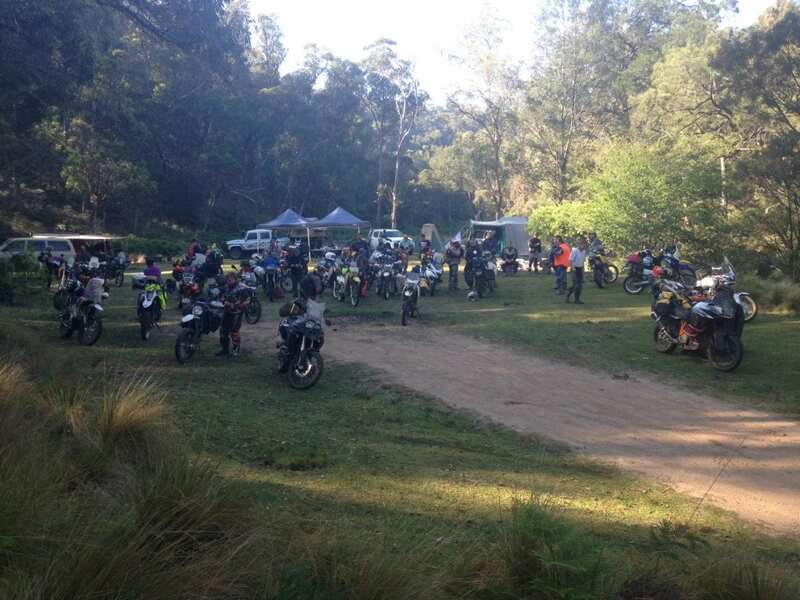 This was a good call as riders came from all over the Northern Rivers area, Gold Coast and beyond. Our afternoon planned back tracks to Drake would have to wait for another day. With time getting on this was the smart decision for riders to break into groups for the their choice of road home. Progress for us was a little slow with one wobbly tyre and just as we turned East from Tenterfield a massive storm like a giant appeared above the trees in the distance. Can you believe it after all that dust we were donging the wet weather gear and about to get a belting! Many thanks to the organisers Dave and Karen Ramsay, friends and like from the Northern Rivers Group. Our Coff’s 4wd friends and to all the other riders for making the ride so awesome, till next time.